A powerful reminder of why nobody has ever truly taken Warcrafts rusty crown. What is it? The fifth World of Warcraft expansion, taking characters to Level 100 and sending them back in time to an alternate history where the Orcs not making a terrible decision could have even worse ramifications on the present. Also, there’s loot. 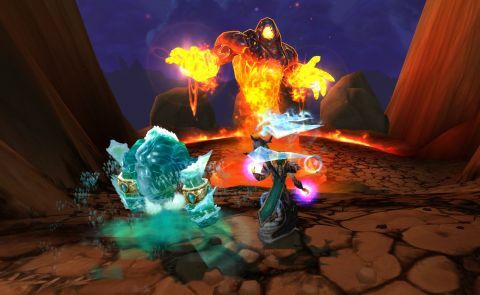 Warlords of Draenor is Blizzard going back to its roots, if hardly back to basics. Orcs. Humans. The raw power of the Horde, in a land of blood and fire where legends are forged and sometimes broken. It’s also some of the best MMO content that Blizzard has ever made, combining the raw ambition we saw back in Wrath of the Lich King with the expertise earned from another six years worth of practice, refinement and technological progress. The plot this time centers on the world of Draenor, before it became Outland—as seen in the Burning Crusade. A little time travel and divine meddling has rewritten the past. Pandaria villain and former Warchief Garrosh Hellscream is taking a break from playing Hearthstone to give the orcs of the past access to modern technology. Now an Iron Horde powerful enough not to need to drink demon blood has risen to attack the present, drawing the greatest heroes of the modern age back through the Dark Portal to save the past. As you step out of the super-sized portal, you see this expansion means business. The army waiting at the start of Burning Crusade has nothing on this one, from its massed legions to a tank that earns its name “The Worldbreaker”. Despite that though, Blizzard is at pains to point out that while the threat is mighty, you’re now officially one of Azeroth’s heavy-hitters yourself. Where once your achievements were brushed off so that some random guard in a nowhere outpost could have you go get him lunch, now you’re given proper respect wherever you go, from soldiers cheering as they see you approaching, to being awarded full control of your faction’s main Garrison. While the threat is mighty, you’re now officially one of Azeroth’s heavy-hitters yourself. This is Draenor’s biggest change, and its best. The Garrison acts as home for the expansion, but it’s also a functioning base. Once you were piled with meaningless crapwork by uncaring leaders, now you get followers and the power to give them the crapwork—or to have them join you in the field as your bodyguard. As the base grows, you unlock more plots to build on and additional buildings to construct and upgrade. Each has its own purpose and a couple of upgrade levels that you can start working on after hitting the new level cap (a nice round 100). The Gladiator’s Sanctum for instance is for PvP players, unlocks Safe Fall and underwater breathing while in Draenor, as well as opening up a new collection resource. It’s also possible to hire the likes of Jewelcrafters and Enchanters to fill in skill gaps and (slowly) make resources for crafting Draenor’s new gear. The whole system is simple but effective, with the physical presence of recruited Followers and a sense of life that makes it feel like your own place despite everyone using one instanced map. The only real catch is that it’s a pain to have to keep returning to assign Followers and put in orders. It’s a very Blizzard type of addition. You can certainly point to games that have done bits of it before, like The Old Republic’s follower system, but nobody has ever taken the pieces and polished them up so well. Nor has anyone else made it this fun to be in charge. Along with your main Garrison you get a number of Outposts in the wide world, each of which offers a choice of two buildings and a super-ability for that zone. Initially, you can summon a couple of soldiers to help. Later, you get toys like a giant mech that shreds whole armies of enemies for 30 seconds, and an insanely destructive tank that’s yours until the health runs out or you go inside. There’s little funnier than one-shotting a talky boss by simply calling an artillery strike on their head, because you are now the goddamn Commander of the goddamn Horde, the scourge of Illidan, Arthas, Deathwing and Hellscream, and you demand respect. The whole campaign has this kind of fun to it—the tacit acknowledgement both that game balance in single-player PvE is utterly irrelevant, and that players are more likely to stick around if they have a good time than if they simply feel grudgingly pot-committed. As such, levelling is fast, clever and full of fun and variety, to the point that for once I actually felt sad when I dinged 100. I did however really appreciate the narrative flow of it, and in particular that the end of the base Draenor campaign ends with a genuinely powerful plot moment rather than simply petering out and waiting for future updates to bring in the raids/bosses. It’s still World of Warcraft, of course. There are bear asses to collect and 10 of these to kill followed by 20 of those, and nothing you encounter is going to cause any real trouble. Within that template though, Blizzard schools every other MMO developer with its sheer number of cutscenes, dramatic moments, and epic battles, the latter often using the Scenario system introduced in Pandaria for single-player missions. That allows for things like a Garrison invasion (this happens once as a plot point, and then becomes regular endgame content) or an all-out siege on an enemy fortress. It’s also fixed one of my biggest annoyances: single-player questlines that end in Dungeons to try and force you to team up with a bunch of blithering randoms to get plot closure. Dungeons themselves follow the usual pattern of linear corridors, trash mobs, and bosses with interesting gimmicks (helpfully explained in full by the Dungeon Journal). The final challenge in the nature-themed Everbloom for instance is a giant tree that spreads spores you have to stamp on before they grow. The end of levelling dungeon Skyreach, features birds trying to drop players off the edge, and a laser that burns through the safe zones. It’s familiar stuff, and the dungeon concepts so far not desperately exciting, but there’s two years to go. As a setting, Draenor might just sound like Outland revisited. In practice, they’re worlds apart; same place, very different time. From the ice and lava of Frostfire Ridge to the overgrown fungus that litters its swamps and quiet beauty of Shadowmoon Valley, this is a beautiful place. Only Nagrand feels like a return visit, and even that has been given a massive upgrade—huge cliffs and grass fields replace the plains of old. Where previously the Throne of the Elements just had a couple of sad little Elementals pretending to be gods, now they earn their titles. It’s hardly the jaw-dropping beauty of a Dragon Age: Inquisition or other such showpiece, but it’s still a gorgeous world that shows the power of great art direction on even an old engine. That said, the long-overdue refresh of the character models is welcome. All of this praise does of course hinge on you being ready for more of World of Warcraft. Good as the improvements are, this is an evolution of the game rather than a revolution, and it's a continuation down WoW's existing path. It's casual-friendly, pushes a personal story, and leads you by the hand through its zones with only a smattering of more general content, like bonus objectives, and ‘rare’ zone bosses that require tag-teaming. A lot of what Blizzard does with this is relatively subtle. The later questlines in particular quietly introduce mechanics that will become key in later dungeons and raids. If you feared that the core game was becoming too casual before though, you’re not likely to change your mind now. As a jumping-on point, Draenor is an oddity. You get a free Level 90 boost to go straight to the new content, and I have no problem with that. Draenor is where the action is. If you’ve bought Warlords of Draenor there’s no reason to spend weeks slogging through the completely deserted old worlds to get to the game that finally appealed to you. In planting its flag so deep in lore though, you’re missing a lot if you don’t know who, say, Garrosh Hellscream and Durotan are (especially playing on the Horde side), and the opening is unafraid to throw a million names into the mix. Past the intro it settles down and becomes more exploratory, but it’s still going to be intimidating in terms of both lore and mechanics. Warlords of Draenor is of course not a finished thing so much as the start of up to two years worth of story and content—the next chapter in World of Warcraft’s story. If you play already, you’ve bought it already. You have no choice. It’s hardly a hardship though, when it’s not simply more World of Warcraft, but a genuinely surprising re-energising bolt. If Pandaria felt a bit like Blizzard flapping around after such a good run, this feels like there actually could be another ten good years in the old girl. There’s no ignoring that it’s a game from 2004 and its mechanics increasingly creak compared to more modern MMOs, but still Warlords of Draenor manages to give us a journey that feels fresher and more exciting than even their best bits glued together. A triumphant return to form for both Blizzard, and its world.